Sometimes the things we plant surprise us. Four - five years ago I planted some banana plants. Though some people call it a tree, the banana is really a giant herbaceous perennial. Soft-tissue stems support giant tropical leaves on plants that range from 4' up to 15'+, depending on the variety. Most are tropical or subtropical, suffering significant damage to the leaves and stems in a normal winter in the Sacramento Valley. 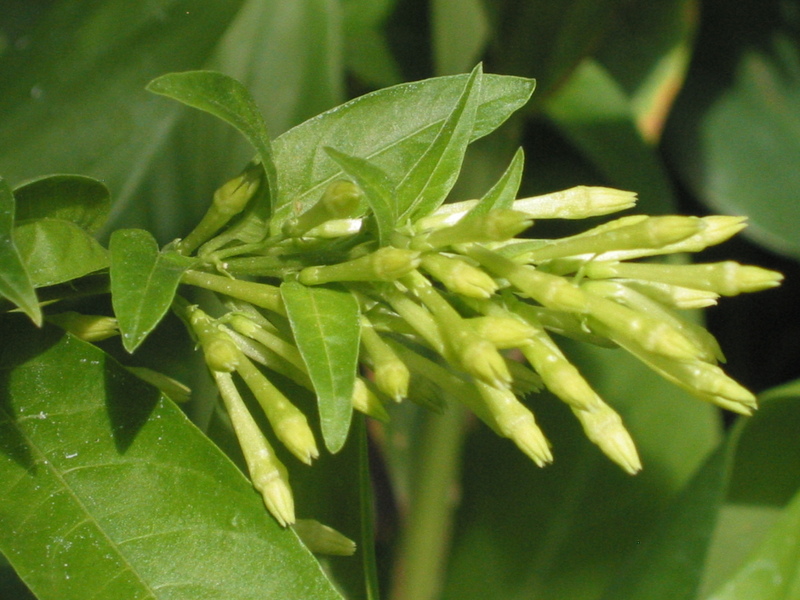 The plants may be killed to the stem, pushing out from the center in late spring. More tender varieties are killed to the ground, re-sprouting from the roots (if at all). My banana plants look terrible every winter, but I just wait patiently until new growth sprouts in May and then cut off the frost-blackened leaves. Bananas usually flower and fruit only on two-year-old shoots, and winter cold usually kills them back pretty hard. So imagine my surprise, as I was strolling by my largest clump, to spot a large bunch of baby bananas. These aren't your Cavendish bananas, the variety you see at the grocery store. Those fruit come from plants which are far too tender to grow here. Mine are the short, stubby fruit you might find in specialty markets. Have you ever noticed how an unripe banana, or the banana peel, puckers your mouth? Those same astrigent compounds, similar to what you find in persimmons, are more prevalent in the cooking banana varieties, so they benefit from frying or broiling to draw out the natural sugars, or sweetening with a glaze. I'll let you know. Should you try to grow bananas here? I thought about this as I read with some amusement the rant of another plant professional on the topic of Bougainvilleas in the Sacramento Valley. My friend and lifetime master gardener Fred Hoffman has garden shows on local AM stations KFBK and KSTE (Sunday mornings), and writes a garden blog. Responding to a recent question, Fred replied "It is not uncommon for the big box stores to ship the same tropical plants throughout the state, especially bougainvillea. 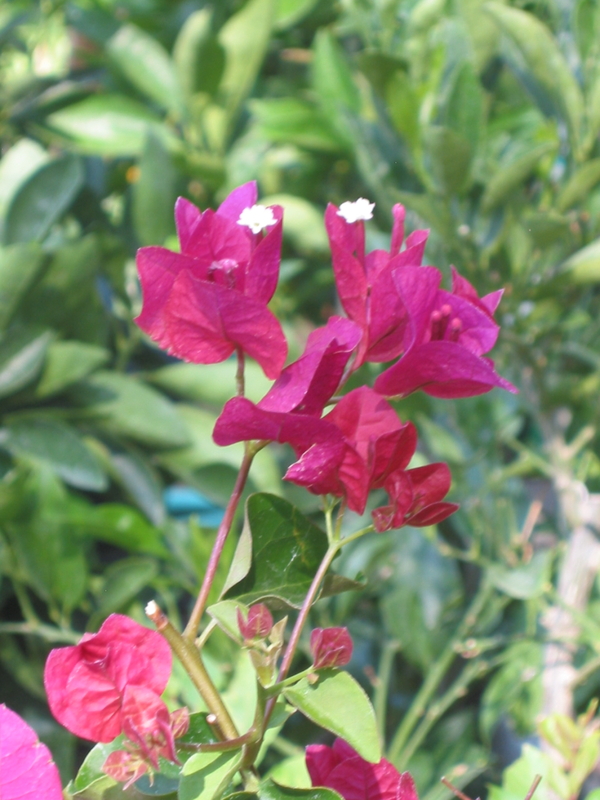 Bougainvillea may survive year after year in the Bay Area or Southern California. But here in many parts of the Central Valley and the foothills...grow it and enjoy it as an annual. Buy it in April...compost it in December." Now, I have seen healthy well-established bougainvilleas in Davis. They will survive our winters if you plant them on a south- or east-facing wall, under an overhang, with special measures taken to protect the plants during their first couple of winters. Vigorous varieties such as Barbara Karst and San Diego Red can re-sprout quickly, even after a hard freeze, grow rapidly, and bloom freely all summer. But every few years we are likely to lose them unless we take special precautions. I agree that it is misleading to just put them out in a garden center and sell them without some major caveats, and the same goes for several other popular subtropicals. It seems that wherever we live, we try to grow things that are out of their range. I remember my father trying to grow papayas and sapote (tropical fruit) in San Diego. My grandfather told of seeing heated glasshouses in Scotland - filled with cactus. There are bananas that are hardy enough to grow here, so long as you don't mind blackened leaves in winter and well into the spring. There are varieties of Bougainvillea that improve your odds. But there are some plants being widely sold that will not live through the winter unless you bring them inside! 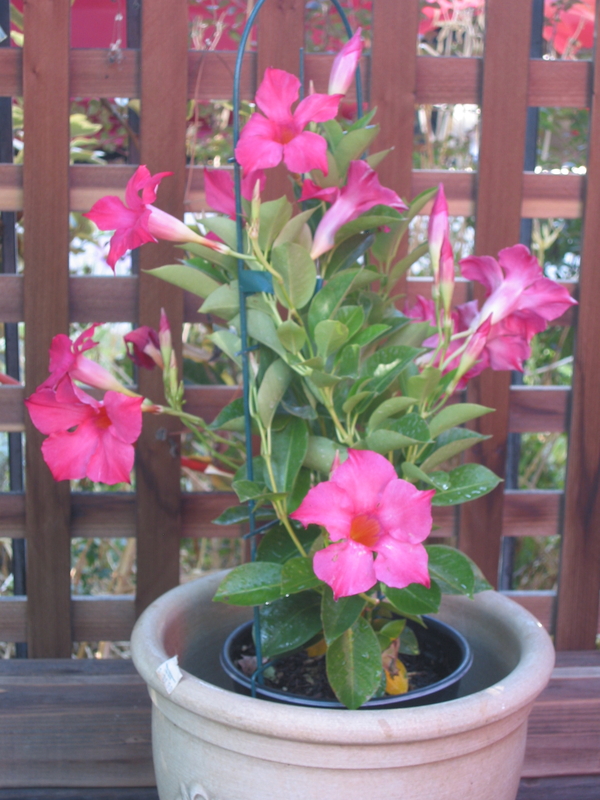 Several growers have been selling spectacular new varieties of Mandevilla, the Sun Parasol® series with hot pink and crimson flowers. This is a great vine for containers, giving quick growth and showy flowers for the entire warm season. But it won't survive more than a couple of frosty nights. The fact is that we do grow many subtropical and tropical plants with varying expectations. 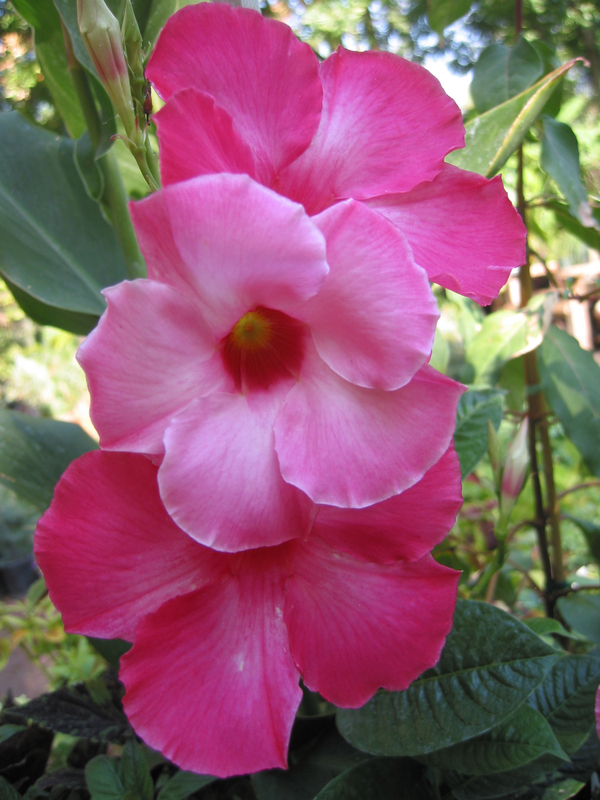 Some of our popular "annuals" are really subtropical or tropical perennials that are killed by frost here: impatiens, petunias, Vinca rosea, even peppers and tomatoes. Lantana is a woody shrub that dies to the stem or ground each winter, so we treat it as a deciduous perennial here; in Southern California it never loses its leaves, and blossoms nearly year-round. The problem, in my opinion, arises with plants that we expect will be permanent parts of the landscape: shrubs, vines, and especially trees. Every year I get questions about Jacaranda trees, as there are a couple of plants persisting around town showing off their royal purple flowers in late spring. You are welcome to grow this tree, but understand that every few years it will be killed to the ground. It is likely to re-sprout, but it won't have a central trunk or look like a tree. Jacaranda mimosifolia, for us, is at best a shrub. Citrus are the best-known examples of trees that we grow which hail from subtropical areas and which may need some special protection, especially during the first couple of winters or during unusually cold episodes. Many people are willing to do that for the tasty fruit, and most will reward your efforts. A few varieties are too tender to grow reliably here, particularly limes, so they are best planted in containers to be moved closer to the house (or even inside) for frost protection. Most other varieties are fine outside, needing protection only during major freeze events (1990, 1998Š). And even among limes there is one hardier option: Bearss is a true lime which grows and fruits here with minimal protection. What is the retailer's responsibility in all this? An informed customer will be a happy and successful customer. Most people don't know that the "big box" retailers don't decide what plants they sell. The growers do, and the growers big enough to stock them aren't local. The truck drivers stock the plants and water them, and the big stores only pay for them when they actually scan the label at the register. So while the plants may be perfectly healthy, they may not be appropriate for the region, may not be displayed in a manner that indicates any special care requirement, and may not get follow-up care. But the propagators and growers are trying to help you. 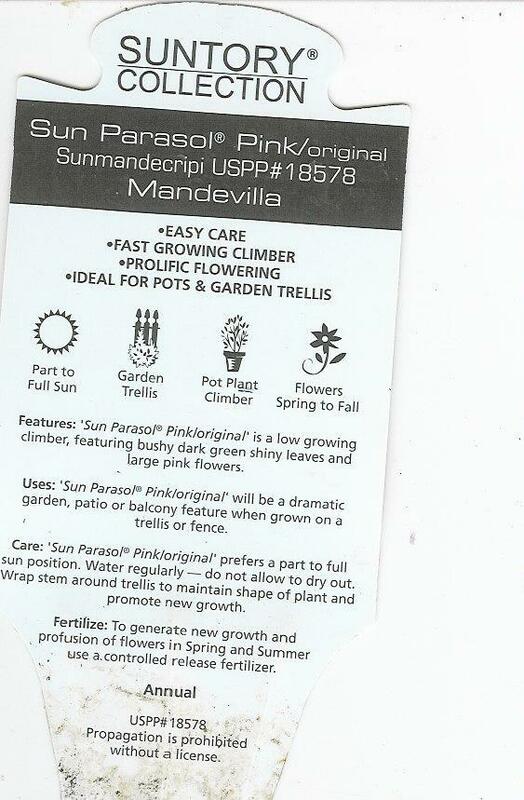 Look closely at the label on that Mandevilla that you bought. There, after all the cultural information about sun, soil, and watering requirements, is the big bold word ANNUAL. While this is a bit of a misuse of the term - a true annual is a plant which grows, flowers, seeds, and then dies in one season - it is a reasonable appellation in the Sacramento Valley for something which will die at 32 degrees. It is also a pretty funny label to find on a plant that is lined out in the vine display at the large retailer. Sell it as an annual, buy it as an annual, and keep your expectations low about its survival. The Sunset Western Garden Book is a useful guide if you know the zones listed. The Sacramento Valley comprises Sunset zones 8,9, and 14 (Davis is 14). As Farmer Fred says, "this ain't Hawai'i, folks!" If Sunset says a plant grows in the Bay Area zones (15 - 17), we can probably grow it here with some frost-protection measures. Find a microclimate in your yard that traps heat on winter days: south-facing walls, overhangs, enclosed patios. If Sunset lists a plant for the mild parts of Southern California only (Zones 21 - 24), or for Hawai'i (Zones H1, H2) it had better come inside by Hallowe'en and stay until nearly Easter). How much room and sunlight do you have in that spare bedroom? Be informed and keep your expectations realistic. Then your banana might surprise you. For more information on bananas in California, check out the web site of Monterey Bay Nursery and look for : Musa, the genus that includes edible and ornamental types.